In November 1977, John Martyn released what’s was undoubtably one the finest albums of his career, One World. It was an atmospheric, experimental and genre-defying album. Everything from folk, jazz, reggae and rock melted together over eight tracks. Released to overwhelming critical acclaim, One World was hailed a classic album. This was the second classic album of John Martyn’s ten year recording career. The first came four years earlier, in February 1973, when John released Solid Air. Released to widespread critical acclaim, Solid Air critics realised, was without doubt, the finest album of John Martyn’s career. It was also the album that saw the Glasgow born troubadour make a commercial breakthrough. This should’ve been the start of the rise and rise of John Martyn. For his eighth album, Sunday’s Child which was released in January 1975, John reigned in his experimental sound. However, Sunday’s Child was a much more eclectic album, with John flitting between country, folk and rock. The result was an eclectic and critically acclaimed album. However, controversy wasn’t far away for John. What started out as a holiday, ended up with John collaborating with reggae producer Lee “Scratch” Perry. One World is seen by some people as the first ever trip hop album. As a resuly, John Martyn is perceived as the father of trip hop and One World a John Martyn classic. After One World, John didn’t release an album for three years. There was a reason for this. By the end of the seventies, John’s marriage had broken down. This led to John pressing “the self destruct button” as he described it. John became addicted to alcohol and drugs. He later said this was a very dark period in his life. 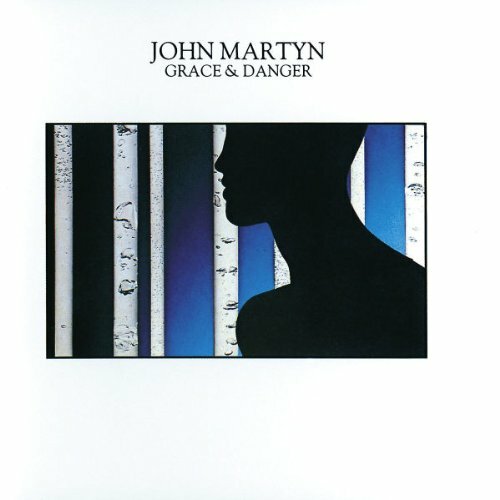 Grace and Danger, which was released in October 1980, was the album that came out of this period, and the start of a turbulent time for John Martyn, both personally and professionally. Grace and Danger was an autobiographical album, that described what he was going through at that time. John’s marriage had broken down and divorce proceedings were underway. This makes the music on Grace and Danger very personal. It’s akin to a snapshot to the pain, hurt and regret John was experiencing. This shines through on Grace and Danger. Eight of the nine tracks that became Grace and Danger, were written by John. They describe what he was going through emotionally. The only track not penned by John was Johnny Too Bad, which was written by Slickers. These nine tracks were recorded by a tight, but talented band. For Grace and Danger, John played guitars and added vocals. His friend Phil Collins, played drums and sung backing vocals. Tommy Eyre played synths and keyboards, while John Giblin played bass. These three musicians and producer Martin Levan were responsible for a soul baring album from John Martyn’s, Grace and Danger. Once Grace and Danger was completed, John delivered the album to Chris Blackwell at island Records. When Chris Blackwell realised just how personal an album Grace and Danger was, held the album’s release back a year. Partly, this was because of his friendship with both John and Beverley Martyn. However, Chris also felt that Grace and Danger was “too depressing and didn’t want it released.” This angered John Martyn. When John heard what Chris Blackwell thought of Grace and Danger, he wasn’t happy. He responded to Chris Blackwell saying: “please get it out! I don’t give a damn how sad it makes you feel-it’s what I’m about: direct communication of emotion.’” Eventually, a year later, Grace and Danger was released. By then, the relationship between John and Island Records was damaged beyond repair. Grace and Danger was released in October 1980. Contrary to Chris Blackwell’s expectations, Grace and Danger was well received by critics. They realised just how personal an album Grace and Danger was, and empathised with what John had gone through. He had just suffered the breakup of a relationship, and was hurting badly. This however, wasn’t the last relationship that broke down during this period. After the release of Grace and Danger, John’s relationship with Island Records deteriorated. John submitted another album to Island Records, The Apprentice. Island Records rejected The Apprentice. However, John had the last laugh. The Apprentice was eventually released in 1990, it was hailed as John’s comeback album. By then, it was nine years since John Martyn parted company with Island Records. A year after the release of Grace and Danger, John left Island Records. This was the end of a fourteen year relationship. During this period, John had released eight albums for Island Records. His Island Records’ swan-song, was Grace and Danger, one of his most underrated and personal albums. Lookin’ On has a jazz tinged arrangement. A bass plays, guitars chime and stabs of keyboards are joined by drums played tenderly. As the drama builds, a tormented John paints a picture. It’s easy to visualise John returning from a night out, to Beverley who quite rightly, is less than happy. John comes “stealing in, with an innocent grin, to leave you staring, at the empty ceiling, feeling nothing, lookin’ on, I’m just lookin’ on.” At that moment, John wonders what’s gone wrong with his marriage? Previously, this type of behaviour would’ve elicited a laugh. Not any more. Things have gone to far. That’s reflected in the urgent jazz tinged arrangement. It accompanies John’s despairing vocal, on this tale of love gone wrong. While Johnny Too Bad wasn’t written by John, it sums up the situation he finds himself in. Just like John, Johnny Too Bad has a penchant for hard living. “With your running, and shooting,looting and tooting, you’re too bad, cos one of these days, you’re going to make your woman cry,” these lyrics could’ve been written about John. It’s as if he realises this, and delivers a gravelly, vampish vocal. Again, he makes the lyrics sound like a confessional. Accompanying him are the rhythm section and guitars. One of the guitars is played through John’s trusty echoplex. Then later, John dawns the role of guitar hero, unleashing washes of a blistering, crystalline solo. It’s the perfect foil for John as he vamps his way through the rest of what could be an autobiographical song. Sweet Little Mystery marks a change in direction on Grace and Danger. It’s the first of a series of ballads. Against a backdrop of twinkling keyboards, synths strings and the rhythm section John tenderly delivers a beautiful, heartfelt ballad about a relationship that’s all but over. Accopanied by backing vocals, John lays bare his soul. His vocal is full of sadness, hurt and melancholy as he sings: “it’s not the letters you just don’t write, it’s not the crying in the dead of the night.” Instead, “it’s that sweet little mystery that’s in your heart, it’s just that sweet little mystery that makes me cry.” These lyrics show just how talented a lyricist John was. He wrote about what he’d experienced, including the breakup of his marriage. It was the inspiration for such a beautiful, poignant tale of love lost. Save Some (For Me) sees John change direction. It’s a mid-tempo track with a punchy, spacious introduction. Drums and synths combine, before John’s tender vocal enters. He leaves space between the lyrics. This adds to the urgency of the arrangement. Soon, John, accompanied by backing vocals from Phil Collins, combines power, emotion and urgency. Behind him, sci-fi synths, shimmering keyboards and the rhythm section combine. They play a supporting role in another emotional roller coaster. Our Love closes closes Grace And Danger, John Martyn’s Island Records’ swan-song. Phil Collins’ drums set the scene for the rhythm section, keyboards and John’s needy, hurt filled vocal. Memories come flooding back, back to a time when their love was young. Things were good, the future looked bright. “Our love, once was you and me against this world, made a man from a boy and made a woman from a little girl.” Not any more. Now I find I have to beg before you call my name, please call my name, please call my name, and baby take a look, take a good look, baby, baby take a look in your heart.” As John delivers these lyrics he wells up, regrets omnipresent at the hurt he caused, and the love he lost. While Grace and Danger was well received upon its release, it wasn’t the commercial success that John Martyn classics like Solid Air or One World. This had nothing to do with the music. Partly, it was to do with the type of music that was popular in 1980. By then, John Martyn’s music was the polar opposite of the post punk, hip hop, electronica and new romantic music that filled the charts. Then there was the fact that Chris Blackwell didn’t like Grace and Danger. Chris Blackwell found the music on Grace and Danger “too personal” and “depressing.” As a result, Island Records didn’t seem to cover themselves in glory when it came to promoting Grace and Danger. This was a huge mistake. After all, here was an album that spoke to many people. Grace and Danger was the story of many a failed relationship and marriage. For many, who had loved and lost, Grace and Danger spoke to them. It said everything that they wished they could. Thirty-five years later, that’s still the case. Many suffering the heartbreak of a marriage breakup, have found solace in Grace and Danger. John speaks for, and too them on Grace and Danger. He’s been where they’ve been, and experienced the hurt, heartbreak and regret. Each song brings back a memory, often, a memory of better times. Especially Our Love, which closes Grace and Danger. John is at his most eloquent, writing “Our love, once was you and me against this world, made a man from a boy and made a woman from a little girl.” Not any more. “Now I find I have to beg before you call my name, please call my name, please call my name, and baby take a look, take a good look, baby, baby take a look in your heart.” Not only does this prove the perfect way to close Grace and Danger, but sums up succinctly, the thin line between love and hate. That’s one of nine reasons why Grace and Danger is a forgotten classic in John Martyn’s back catalogue. Quite simply, Grace and Danger is best described as the most personal album John Martyn ever released. It’ tells the story of one of the worst periods in his life, where the newly heartbroken John Martyn lays bare his soul for all to see and hear. What would’ve been fascinating, is if Beverley had replied to Grace and Danger. We could’ve heard her side to the story. Sadly, that never happened, and despite Beverley making a recent comeback, is unlikely to ever happen. As a result, Grace and Danger, one of John Martyn’s most underrated albums, remains one of the most soul-baring and cathartic breakup albums ever released. ← THE PHANTOM BAND-FEARS TRENDING.